This spread is dedicated to some of my favorite intentions for well-being to start off this day: trust, simplicity, balance, and embracing inspiration in today’s moments…I like that! 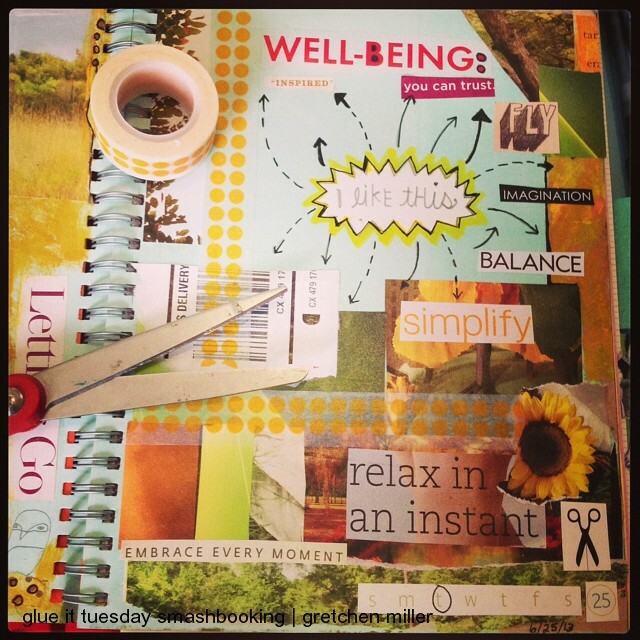 This entry was posted on	June 25, 2013 at 10:00 am	and is filed under art journaling, collaboration, creativity, self care. I also like that, good way to start your day! Perfect way to start a day! Such a positive, happy page! Great way to start a day! Nice collage art! always love your collages, gretchen! this is great! Colorful page with great messages. Such a positive, happy page. thanks for sharing.